A great deal of fun for you and your friends! Grab a partner and get ready to play. 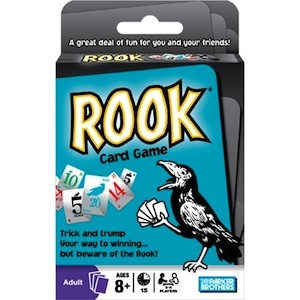 Rook is all about being the first team to reach 300 points by bidding and naming tricks. But beware the wild Rook; when he lands, everything can change. And it's not necessarily for the better. Trick and trump your way to winning - but beware of the Rook! Includes 57 cards and instructions.